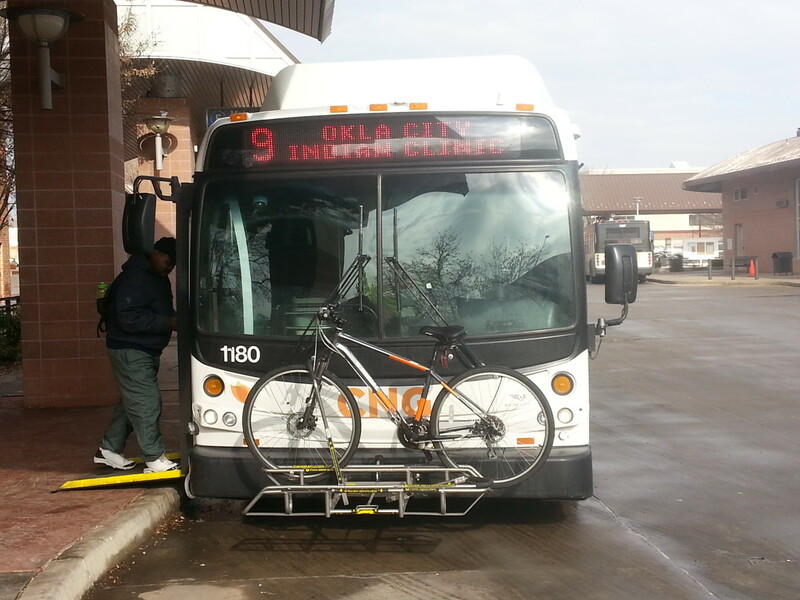 A bus at the downtown Oklahoma City station. Oklahoma’s biggest transit systems, often used by low-income people, provide relatively sparse service compared with those of other cities in the region and beyond, but ridership is on the increase, federal data shows. After a decline two years ago, the number of trips taken by passengers in the state’s four largest systems has rebounded and promises to increase further as the Oklahoma City and Tulsa systems implement changes that will boost the frequency of bus service. From fiscal 2007 to 2011, the number of annual unlinked passenger trips in the four transit systems – almost all of it on buses – rose to well over 7 million, then slipped to 6.9 million. In the past two years, the count has risen to above 7.5 million. An unlinked trip is when a passenger boards a bus, even if transferring from another bus. Until 2012, the four agencies reporting annual figures to the National Transit Database were the Central Oklahoma Transportation and Parking Authority (Oklahoma City area), the Metropolitan Tulsa Transit Authority, the Lawton Area Transit System and the Cleveland Area Rapid Transit (Norman and the University of Oklahoma). Edmond’s system, which began operating in 2009, started filing annual reports in 2012. Oklahoma’s rural systems are not required to report annually to the database. 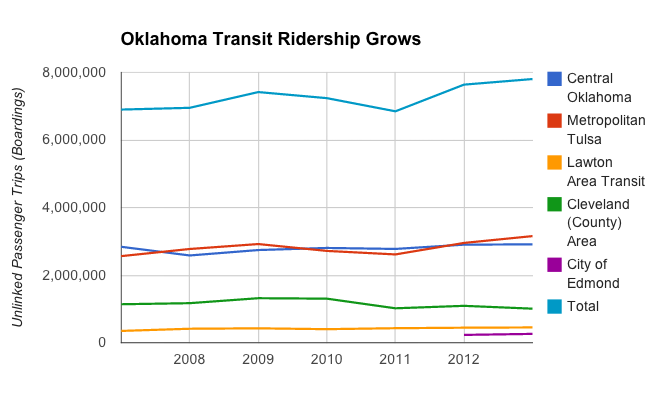 Despite growth in riders, Oklahoma remains a transit-thin state. Bill Cartwright, general manager of the Tulsa authority, said the extent of service offered in the state’s urban areas lags that of other cities in the region. 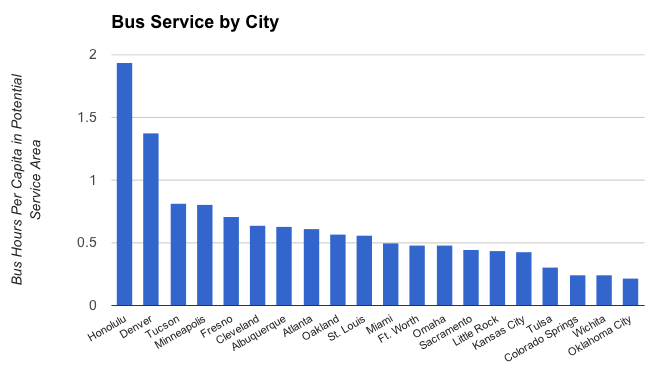 A chart prepared by the Tulsa transit agency, based on 2010 federal data, shows that Oklahoma City had fewer hours of bus service per capita than Wichita, Tulsa and many other cities. Tulsa’s rate also was low. In many cities, transit is used most frequently by lower-income residents. Systems with limited service pose problems for the working poor, who may have no vehicle and depend on transit. Cartwright said the last survey of Tulsa riders found that 54 percent were using the system to travel to and from work, and 11 percent were traveling to and from school or vocational training. “With the economy improving, you would expect that (transit) activity to improve as well,” he said. Oklahoma City and Tulsa are taking steps to increase their service. The Oklahoma City agency is revising its bus routes next year so that the buses travel only on major streets, not through neighborhoods. The agency also will increase frequency of service using an additional $1 million in funding, said Michael Scroggins, spokesman for the Oklahoma City-area system. Most routes will have more than a 30-minute interval between buses. The city’s system still does not operate buses after about 7:30 p.m. on weekdays or on Sundays. In September, the capital’s City Council also approved the first phase of a 4.5-mile streetcar rail project under the Metropolitan Area Projects, or MAPS, improvement program. The $129 million system, scheduled to open in 2017, will serve as a circulator in downtown and adjacent areas to the north using five or six vehicles. Possible future extensions are mapped to the northeast, northwest and south. In many larger cities, including Dallas and Phoenix, the urban rail systems are full light-rail ones, a level above streetcars, although railed streetcars look similar. The streetcar circulator will cater mainly to visitors and downtown employees, students and residents, Scroggins said. If the streetcar system is successful, it may help convince voters in the region to eventually approve dedicated funding for expanded rail service, he said. A 2011 study sponsored by the Federal Transit Administration found that downtown circulator projects succeed best when, among other things, they have stable, reliable funding, are branded well and cater to visitors and tourists. In Tulsa, voters approved a bond issue in November that includes $15 million for a Bus Rapid Transit system. BRT buses will make fewer stops and run more frequently than local buses along mainly Peoria Avenue. The buses will stop at new designated stations. Cartwright said it will take between two and three years to get the service in place; acquiring the new buses alone will take a year and a half. The agency also is doing a route assessment to better match its service with demand.